Powers/Abilities: Rimthursar has a number of magical powers, enabling him to change into a hawk or other forms, and cast a number of powerful spells, such as transforming and controlling others. As an Asgardian god, he is immune to disease and ages at an extremely slow rate. He also has superhuman physical abilities, including strength (Class25-50), durability, etc. He carried a magic sword, which scared the Dwarves, but was no match for Mjolnir. He greatest weapon was the Silver Chalice. (Thor I#320 (fb)) - In Asgard, long before Thor's birth, the grim god Rimthursar collected the ursine Borna, the mermaid Fairgold, the bovine Grult, the falconine Kyrie, and the serpentine Slithgarn, keeping them caged as his Menagerie. (Thor I#320 (fb) - BTS) - From his Silver Chalice Rimthursar used to drink a form of wine believed to have been related to the blood of mortals. 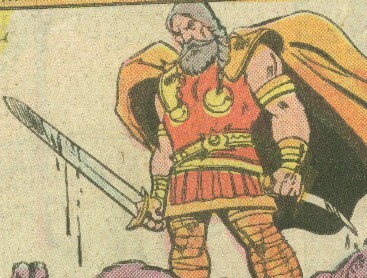 (Thor I#320 (fb)) - Rimthursar became ambitious and sought to use his Menagerie against Odin himself. When they refused to act as his quislings, Rimthursar slew them all in a rage. Sealing their souls each in a single drop of blood, Rimthursar then stained the bottom of his Silver Chalice with the five droplets, freezing the Menagerie within the drinking vessel. (Thor I#320 (fb)) - In a final pique of fury, Rimthursar cast the Silver Chalice down to Earth. (Thor I#321 (fb) - BTS) - Rimthursar faked his own death, after which he lived on in other shapes and names. One of his more recent names was Farbauti. (Thor I#321 (fb)) - In the form of a hawk, Rimthursar flew to the waterfall maiden Freya, telling (lying to) her that Odin had died, causing her to weep tears of gold. Changing to his true form, Rimthursar offered to dry her eyes, pocketing the golden droplets for his own later use. Rimthursar then went to the Dwarves of the Mound, bidding them to fetch serpents, threatening to kill them if they refused. He then sacrificed a bear atop the Mound and had the Dwarves lay the living serpents atop the blood-soaked Mound. As the serpents squirmed, Rimthursar sprinkled the golden tears over them, bidding them to bind the mound; this they did, meshing over the whole of the mound and locking it in the grip of his sorcery. With his magic sword and many oaths of sorcery he then sliced the Mound from its foundation, destroying the Dwarves' home forever. Rimthursar harnessed the Mound to a six-legged bull and had it haul it to a mountaintop closer to the sun. There the Mound melted as he dropped feather's from his own hawk-guise onto the remaining components. These combined elements formed a spell to grant the Menagerie new forms by taking human hosts. (Thor I#320 (fb) - BTS) - Rimthursar's Silver Chalice was placed on display in Viking Exhibit, which eventually came to Chicago's Field Museum. (Thor I#320 (fb) - BTS) - The Silver Chalice was observed by Drs. Shawna Lynde and Don Blake, and Blake's association with the Asgardian Thor triggered Rimthursar's spell, with images of the Menagerie briefly flickering on the Chalice's surface as they left. (Thor I#320 - BTS) - Rimthursar's magic followed Lynde and Blake, eventually transforming Lynde and several other mortals in her vicinity into incarnations of the Menagerie. Lynde became Kyrie, while Nurse Stevens became Fairgold, patient Thorne Kirby became Grult, and a pair of movers became Borna and Slithgarn. A beam of energy from the Chalice sent Borna into a rage until Thor subdued him and the madness faded. Thor incorrectly assumed Loki to be the cause of these events. (Thor I#321) - Thor brought the Menagerie to Asgard, but was forced to leave them on Bifrost as they had taken mortal form and were forbidden to enter Asgard. Thor questioned Loki, who sent him to the Dwarves, but while he was occupied thusly, Rimthursar appeared above Bifrost and transported the Menagerie to the Chicago's Field Museum. The Menagerie refused to serve Rimthursar, but he simply reactivated his old spell and took command of them. He sent them in to Museum to obtain the Chalice; meanwhile, Thor investigated Rimthursar's Asgardian abode, finding it empty, and then receiving a message written in the sky by Rimthursar, telling him that he would claim the Chalice and then Asgard, as well. Returning to Earth, Thor fought the Menagerie, and Rimthursar flew into the museum and claimed the giant Chalice himself. Thor allowed Rimthursar to escape the museum to avoid a fight there that would damage its priceless treasures. Thor followed Rimthursar to Chicago's yacht basin and confronted him there, but the Menagerie--who had followed them both--then ambushed Thor. Still, Thor managed to summon a lightning bolt that shattered the Silver Chalice, and the Menagerie collapsed to the ground. Thor and Rimthursar then fought, but the Cruel Striker's magic sword was no match for Mjolnir, and Thor made short work of him. As he dragged the fallen Rimthursar behind him, Thor was pleased to see the Menagerie revive, but was still frustrated that they were in the animal forms even after the Chalice had been shattered. (Thor I#322) - Thor brought Rimthursar and the Menagerie to Bifrost, and he bade Heimdall to summon the jailers to take the still unconscious Rimthursar into charge. Comments: Created by Doug Moench, Keith Pollard, and Stone & Tartag. Interesting story, but Rimthursar should have been able to reclaim the Chalice from its mortal holders without ever involving Thor. Certainly after Thor was involved, he could have done without leaving a message telling him that he had gone after the Chalice. If he threw the Chalice away before Thor was born, and if the Chalice was so powerful, why did he wait so long to go after it. Yes, interesting story, but don't try to make too much rational sense of it. I guess Rimthursar would have met his end during the recent Ragnarok (Thor II#85), but we don't know for sure that he hadn't escaped extradimensionally at some point. I'll tell you what I do know, though. Thor, and most likely the rest of the Gods will be back at some point. His name translates as "Cruel Striker." He was a Jotun/Giant who was the father of Loki. Loki's mother was the giantess Laufey (also called Lausus in some texts). The myths say that Farbaut struck Laufey with a bolt of lightning and she conceived Loki that way. Farbaut was also the ferryman who ferried the dead across the river Gjoll into Niffleheim. He could be retired by now. Apparently Loki's father was the God of Death according to some sources. Offhand, it's really Hrimthurssar. This is the original spelling and it refers to the collective name of the Frost Giants of Jotunheim. task could be done in that time and then they would not have to pay. Hrimthurs had the help of Svadilfari, a deer, to help him and actually started finishing a head of schedule as the gods worried they might have to surrender on their promise. Looking to Loki to do something, the trickster turned himself into a stag and distracted Svadilfari for a while. The two of them sired Sleipner. Without his help, Hrimthurs did not complete the wall on time and did not have to be paid. When Hrimthurs threatened to just take what he'd been promised, Thor returned home from a long trip and slew him. This story is mythologically important because of two things. Its the first sign of the gods enmity with the giants and its Loki's first role as a mischief maker. In some form, this story was adapted in Thor I#294-295, with the giants Fafnir and Fasolt being promised Idunn (who is often confused with her mother Freya) by Loki and Odin if they rebuilt and fortified the walls of Valhalla. In the MU, Farbauti is Loki's MOTHER, and Laufey is Loki's FATHER! Stan Lee got it reversed, but then that's creative license for you. It's also possible that things were different in the differing cycles of Ragnarok and creation of the Asgardian Gods. It's also possible (disturbing, but possible), that Rimthursar/Farbauti, as a shape-changer, actually did seduce Laufey and used magic to conceive Loki. An argument could be made for Farbaut to be the father of Farbaut. This would make Farbaut the grandfather of Loki. Extrapolating on this idea, one could surmise Farbaut is unaware he has living relatives and just believes his daughter, her husband and child were killed by Odin and the Asgardians. I've personally had a sneaky hunch that Utgard-Loki is a grandfather or at least ancestor of Loki, but while several of my assumptions usually turn out to be true, this one stays out there. Utgard-Loki is supposed to be the Norse equivalent to the devil and it would make sense to tie together Loki, Hela and Farbaut into him, but that's beyond the scope/intention of the Appendix. What does this all mean to the MU? Possibly diddly-squat. Marvel's Utgard-Loki isn't the devil. Further extrapolating on all of the above, there's no reason that Rimthursar couldn't have been Loki's father's father, either. Loki's father's rebellion against Odin leaves another great untold story. It is unclear whether Rimthursar created this magic item, or if he obtained it from some other source. Nonetheless, it enabled him to control the Menagerie in the past, and he later claimed he could use it to control everyone on Earth and/or Asgard. He also claimed he could use it to turn all mortals into beast men. It also proved able to hold the spirits and power of the Menagerie for many centuries. 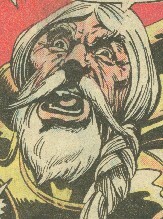 When Thor tried to channel his power through the Chalice to remove the Menagerie from their human hosts, a beam emerged that briefly sent Borna into a violent rage.